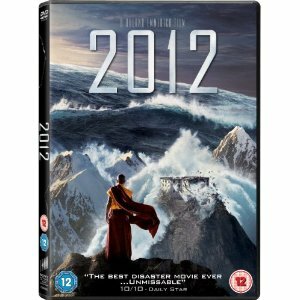 Film Review: 2012 – I Love Disaster Movies! Roland Emmerich, the master of disaster for the 90’s and 00’s bounced back into the limelight with 2012, the all singing, all dancing ultimate end of the world disaster movie. To say the special effects steal the show is an understatement as not even some ultra annoying characters can ruin this epic movie from being a rip-roaring popcorn flick. 2012, as predicted by the Mayans, is the year the world will end. Here, solar flares have boiled the core of our planet and thus the mantle melts, the crusts start to shift and that means plenty of earthquakes, volcanic eruptions and tsunamis to contend with, as piece by piece the world shifts dramatically into a whole new state. Earthquakes, crust shifts, solar flares, volcanoes, tsunami’s, water, terra-deformations, landslips, general chaos! A general bad day at the office then…! No stone has been left unturned in the special effects department and that is the key success to 2012. This is action all the way from start to finish. The world is falling apart about 20 minutes. From the massive earthquake scenes at the beginning with first a car, then an airplane escaping through collapsing skyscrapers to the Yellowstone volcanic eruption to the latest way Roland destroys the White House, you will be absolutely amazed at the sheer quality and detail of the effects. In the buildings, you can see people sliding to their deaths in the tiniest of backgrounds and as the ship capsizes you can see everything sliding across the lit up windows. It’s the attention to each shot that really gives everything the extra authenticity. However, the same can not be said about a few of the characters. John Cusack fails to shine in the lead and is actually so every day he is forgotten as his wife, the President and his daughter, the scientist and basically everyone else in the film basically has much more character built into them. While I can understand why to an extent, it just feels a bit too underplayed for my liking. Danny Glover as the President does a good job, as does Thandie Newton and Chiwetel Ejiofor as the secondary duo. Also great are the children actually. Sadly, spare Tamara (Beatrice Rosen) and the underused Sasha (Johann Urb), the Russian people we follow irritate and annoy beyond belief and its all a bit stilted. The combination of all the above meant that I really did not care if some of them died or not, and that is really the film’s main downfall. A bit of likeability doesn’t hurt anyone, and one of the few characters that does have some character development pops it in a very quick and underplayed scene. It, along with several other deaths lacked impact. As I’ve said before the effects are fantastic. The tsunami sequences are cut down in size as to not go over old ground from The Day After Tomorrow, and the way how possibly 90% of screen time has some kind of CGI in it is somewhat mind-boggling, its shocking just how seamless most of it is. Once again CGI animals are back, which is probably the weakest part of the graphics but its great to see just how things have come on in the last 14 years since Independence Day. The earthquake scene still takes my breath away today. I’ve been quite critical so far, but I have to say I thoroughly enjoyed it. 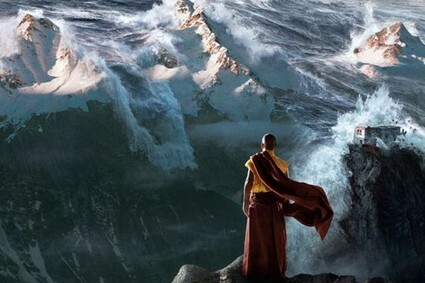 While its not my favourite disaster movie by a long shot, it’s possibly the most visually impressive. Schmultz is kept to a bear minimum (hurrah! ), America once again saves the day but is ultimately destroyed as with all these films and the old Chinese lady decapitating a chicken will always get two thumbs up from me! Plus with film could win cutest animal character award with Tamara’s dog. Finally Woody Harrelson’s character Charlie is fantastic as the crazed conspiracy theorist who cheers on the end of the world with such joy, perhaps should the worst happen, we’d all need to join him at the nearest party! Oh we juuuuuuuust survived outrunning something… again. Easily Charlie, whom featured heavily in the promotional materials and websites for 2012 with all his crazed podcasts and video shows. Although most of the world cops it, the President not only stays behind to face the ongoing tidal wave, but is taken out by his own war boat too! If that wasn’t a political message I don’t know what was! Some cinemas started the film 20:12. How cool is that! 2012 is a full on popcorn film. There is no time for emotional antics, it is bums in seats special effects marvelling. If you would like a bit of depth in your disasters, you will not find it here. If you’re looking to be amazed by on-screen effects and visual treats and aren’t fussed about who survives in the process – this is your 10/10.